Hair is made up of a mainly complex cross-linked protein polymers. Hair grows from an organ under a layer of skin called a hair follicle. Hair roots are embedded into the follicle and the follicle is connected to the body's blood supply so it can help the hair grow. The hair shaft extends through out the epidermis, which is the outer layer of skin, and ends at the tip. The hair shaft has three parts, the cuticle, the cortex, and the medulla. 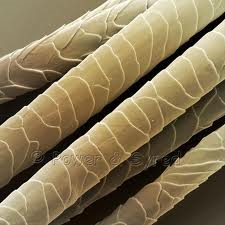 The cuticle is the clear outside covering of the hair shaft. It is made up of tough overlapping scales. The cortex is made up of keratin molecules. Keratin is tough protein made up of about 20 different amino acids. In the cortex is the pigment that makes our hair black, brown, blonde, or red. If we didn't have that pigment our hair would be gray or white. And, that's the cause of gray and white hair. The medulla is a row of cells that run along the center of the cortex. It sometimes appears dark or translucent depending on whether there is air, liquid, or pigment in it. Human hair generally has no medulla or one that is fragmented. How to tell the difference of Animal hair!! Most animal hair sheds. It's length is regulated biologically, which means that it grows to a specific length and then stops growing. Animal hair is all the same basically. Well, for instances, if you have two different cats, of the same breed, you wouldn't be able to tell what hair came from which one because there's no distinct difference in the hair. It measures the diameter of the medulla relative to the diameter of the hair shaft. 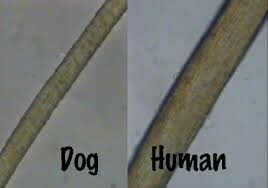 It is used to distinguish animal hair from human hair. Humans have a medullary index of less than 1/3 whereas animals have a medullary index of 1/2 or greater. Human hair can be used for drug tests. You can pull one of your suspects hair and see if they've been doing drugs or something along those lines. We can, also, determine the race of the person's hair found, if it's been cut a certain way or even if it'd been pulled out. Which could help us find the bad guy and plenty of things like that. Hair taken from arms and legs do not have sufficient distinguishing characteristics to be used as evidence. Hair samples can be used to exclude a suspect, like with a negroid (African American) hair excluding white suspects, but, they can only be considered as contributing to evidence since hair is considered class evidence.